...And just how do you paint these coins? Yes, that is the question I hear most often. I think mostly because many people have not seen jewelry like this before. I have been told I am only one of 6 people in the world that are doing this. I had no idea when I started, and so I have had to learn to explain what my jewelry is. 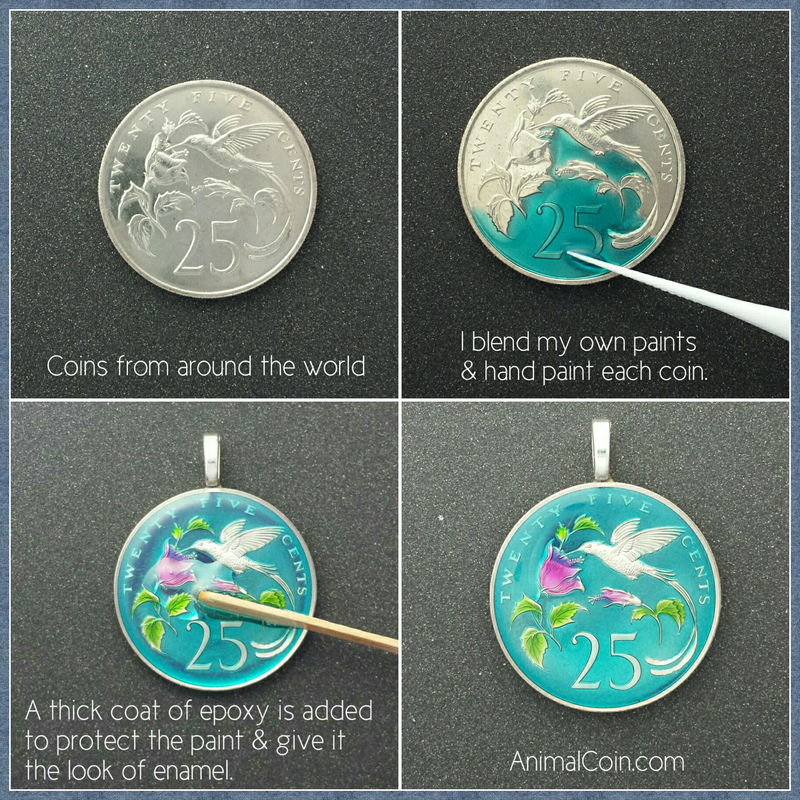 Without giving away any trade secrets (hmmm...I am kidding here), I will try to show you what it takes to paint one of my coins. Might be more than you would expect. I blend my own paints, and each color has it's own recipe of different types and brands of paints. The reason is simple, I wanted colors that were translucent, and that meant being a bit of a "mad scientist." Other coins don't look good with that paint, the color of the coin makes translucent paint look muddy. On those, I add some opalescent pigments to the mix, so I still get the desired color with a little sparkle to it. The first and most important step is to pick a coin with a beautiful design. The prettiest colors on an ugly coin, is still an ugly coin! Fortunately, there are many beautiful coins to choose from. I have become a bit of an expert on the coins I paint. I belonged to a local coin club for 15 years before I started painting coins, and they helped me to learn a lot. First step: I clean the coin carefully, and then paint the background color. Many coins have very tiny details, so I use a magnifying glass, when I need to. I let it dry or "cure" until hard, and then apply the second color, if there is one. I have found that doing one color at a time gets better results, without risking "bleeding" colors. To answer the frequent question of how I get the detail so exact, there is only 1 obvious answer...practice! practice! and practice! When the painting is finished, I complete the front with a thick clear coat to give the appearance of a thick glass surface, much like the look of traditional enameling. To complete the item, I also clear coat the back and add either a pendant or earring bail for hanging. When I first started painting the coins, I asked a number of friends, and they all voted for a clear back on the coin.... then they could see it was actually a coin. So over 5-6 days, all these steps are completed. My biggest thrill still is completing the piece and marveling at the end results. It feels like magic!